Become a licensed Youth Change workshop provider. This is a special opportunity open only to veteran mental health and education professionals who have a special talent for helping troubled kids, and want to share their talent with youth professionals throughout North America. This opportunity is perfect for professionals who are or would like to become talented K12 education speakers training teachers, counselors, psychologists, juvenile justice workers and foster parents. Youth Change has never been able to reach all the parts of North America where we have been asked to hold general sessions of our Breakthrough Strategies to Teach and Counsel Troubled Youth Workshop. Our general sessions are open to any youth worker who wishes to attend. We have long felt that we have amassed some of the best strategies that exist for turning around troubled youth, but felt frustrated that we couldn't hold our general sessions in every corner of North America we were asked to. While our on-site classes hosted by a school or conference or agency will go "anywhere," it is not possible for us to do all the work required to host general sessions in every place that wants one. We have watched dedicated youth workers criss cross North America to reach our general sessions, and have even watched in awe as teachers and counselors have come to us from places as far away as Japan, Hawaii, Alaska, Canada, Australia, and Guam. Believing that our Breakthrough Strategies Workshop may be one of the few places that youth professionals can get the up-to-date, effective tools that they need, Youth Change has begun to make it possible for general sessions of our wonderful problem-solving workshop to be offered throughout more of North America. To reach this goal, we are beginning to very carefully license a very small number of groups to be authorized to market and teach our Breakthrough Strategies class. Our top goal in this licensing effort is to ensure that the top-level quality and no-nonsense practicality of our class be preserved while expanding our reach throughout North America. What does it mean to be a licensed Youth Change workshop provider? Youth Change has begun to offer the opportunity to a few carefully selected groups or people to become licensed providers of our popular Breakthrough Strategies to Teach and Counsel Troubled Youth Workshop. Under a license agreement, a person or group pays us for the right to offer our class in a limited part of the country. This is very different from paying you to be a presenter. We are not seeking presenters. We are seeking top-of-the-line people or groups with the talent, budget and stamina to independently offer our class in a portion of North America. So is Youth Change looking for trainers and presenters to teach the Breakthrough Strategies to Teach and Counsel Troubled Youth Workshop? Absolutely not. We are not looking for people to teach the class. We are looking for talented people who would buy the rights to schedule, plan, and teach the class in a limited regional area, not teach it for us. Please do not contact us if you are just seeking to be a presenter. For quality control reasons, we never use outside presenters. This is something different. It's an opportunity to run the entire show as an independent entity, managing everything from planning through instruction in a limited portion of North America. This opportunity would mean owning your own business or incorporating the license into an existing business or agency. While providing the instruction for the course is one important aspect, we are not seeking instructors. We are seeking people who want to manage all aspects of hosting their own general and on-site Breakthrough Strategies sessions. You would not be paid by Youth Change. You would pay Youth Change for a license, supplies, technical assistance, etc. then you keep any profits you make from your classes. Selected providers are given the right to offer Youth Change's Breakthrough Strategies Workshop in a limited region of the U.S. or Canada. Youth Change provides the workshop supplies, workshop outline and how-to knowledge, and the provider is able to market and teach the class in their geographic region. What exactly do licensees do? You choose where you host classes, and when, then you provide the instruction. You keep all the tuition paid by participants to attend, and you pay for, and do all the work to advertise and arrange the sessions. Typical class tuition is $169 to $259 per participant for the two day class, but you can decide what you want to charge. You can also sell books and other related items and keep the profit. Youth Change can help you with how-to information, and will supply many needed items. Being a licensee is normally a full time business. You can host any number of events in your region. What does a person or group need to be considered for licensing? You must be a talented, veteran youth professional, such as a teacher or counselor or social worker, who has an interest in hosting general sessions of our Breakthrough Workshop in a limited region of North America. You would need to request an information packet as a way to begin checking us out. Once you had reviewed the information packet and talked with us by phone, you would need to plan to attend a live Breakthrough class to review the class for content, philosophy and message to be sure there was a match-up between what we teach and what you believe. What else would a person need to be considered for licensing? You must adhere to the highest standards of excellence, both in your work with youth, and in your contact with adults. Since our Breakthrough class is nearing a 25 year track record of delivering the country's best youth training, we will only consider licensing people or groups who can document a long history of excellence in youth work. Experience in business marketing and hosting seminars is recommended, but not required. Experience training adults is also suggested, but not required. A strong mental health background would be a big advantage, so that is a key element we look for. What does it cost to become a licensee? You should plan on a significant investment, especially for your first year as you are given all the many initial supplies you will need to be able to host sessions. As our goal is not primarily to make money but to share our wonderful class with more people in North America, we have priced the cost to be as reasonable as possible, plus, we do not make decisions based on cost alone. But having an ample budget is a reality of the seminar business. Plan on having a budget ready of at least $6,000-$10,000 for the first year depending on how many states or provinces you select to start with. You would have to be ready to pay all the costs involved with staging general sessions, such as paying for flyers, postage, hotel meeting rooms, etc. These costs are not tiny, so licensing would not be practical for a person or group with little budget. We can give you more precise costs if you call us. It is hard to predict how you personally would perform, and the precise results you would receive. However, Youth Change has a track record of nearly 25 years providing youth workshops, and it has been a very prosperous enterprise. On the down side, anyone in the seminar business will tell you that the seminar business is a volatile business full of surprise, challenges and up's and down's. It is definitely not a venture for anyone who wants an easy, mellow business. It is a stressful, surprise-filled, demanding line of work, but it is also more than an opportunity to make money: it is the chance to transform the lives of children by turbo-charging the skills of those who teach and counsel our society's youngest members. Another big plus: you can finally be your own boss, and rise or fall based on your own decisions and actions. So, yes, being in the seminar business can be enormously rewarding, both financially and spiritually, but it is not the right business for those with a severely limited start-up budget, the faint of heart, the easily discouraged, or the unassertive. What parts of North America are available? Right now, most of the states in the Eastern part of the U.S. are available. We do get much demand from this part of the U.S., especially from New York, New England, Virginia, Maryland and the Carolinas. Parts of the mid-western and central Northern U.S. are possibilities. Much of the Western U.S. is not available. All of Canada is available, but licensees for Canadian regions would probably need to be based in that country. Our workshop has been especially well-received by Canadians who routinely come south to attend in large numbers. What is the next step if I am interested in licensing the class? You must meet the requirements listed above before we would even consider you, such as being a veteran youth professional, having the budget available, and a documented track record of professional excellence. If you don't meet these requirements, please do not contact us about licensing. We are very, very picky about who we will license, and wouldn't even begin to consider people or groups who can not meet the basic requirements. If you do meet the basic requirements, then you can call us for an information packet, and to discuss this opportunity by phone. After that, sign up to take the class, and if it knocks your socks off, then we can begin more serious discussions. Just meeting our criteria will not ensure that we will grant you licensing rights. We are looking for the right people with the right skills, the right standards, and the right chutzpa to match the high standards and high demands that would be encountered. Women and ethnic minority group members are especially encouraged to check us out. What type of workshops, services and other items can licensees offer? Licensees can offer general session and on-site presentations of the Breakthrough Strategies Workshop in a selected region. No one else can provide the workshop in your region. That means you can sponsor general session courses, and you can also train schools, agencies, conferences and professional development institutes. Plus, you can market all of our products. In addition, you can provide breakout workshops using focused excerpts from the Breakthrough Strategies Workshop. 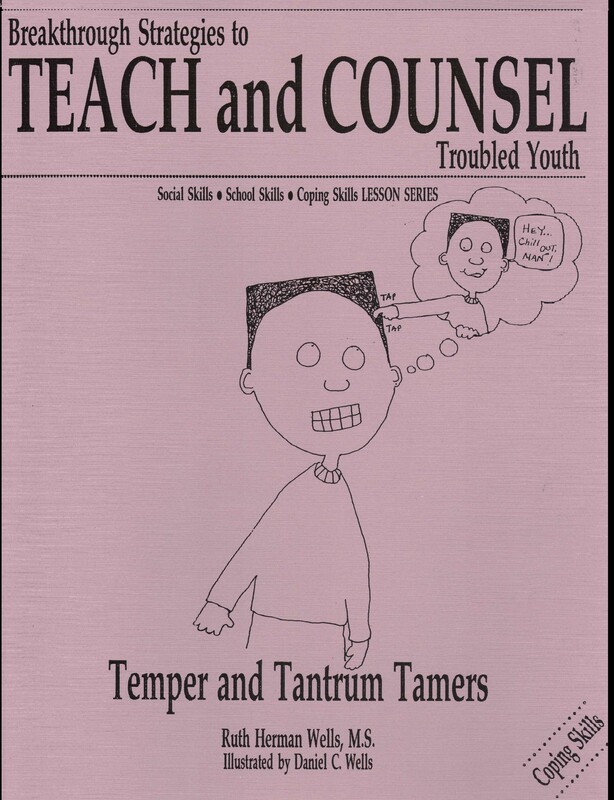 Breakout topics cover a specific, single problem area like motivation, violence, work refusal, or truancy. We can also assist you to learn about offering university graduate and under-graduate credit for all classes, as well as clock hours for many states and disciplines. The preparation we give you is quite comprehensive and thorough. You can also sell our popular Breakthrough Strategies Online Workshop, along with all of our other products. You don't have to be a licensee to market our products. Click here to learn more about marketing our products. One of our most popular books is shown below. For more details on on-site workshops, click here. For more details on general session workshops, click here. For more details on the recorded workshop, click here.